Why should an organization address and comply at least with industry supported practices? A question of compliance versus driving business value, and one often raised in the Payment Card space is important to understand and convey at every level of an organization. The importance is building an organization’s security and compliance program in a manner that cohesively manages the demands of client requirements, government cares, and general competitiveness. In an era where competitiveness includes thwarting attackers focused on poisoning your supply chains with misinformation or directly seeking to “acquire” the Intellectual Property that makes the business competitive. The executive and board of directors within an organization are acutely seeking demonstration of focus and effectiveness. So what are the risks to an organization not managing the risks of an industry standard? To answer that below I will speak directly to PCI (to eliminate the obnoxious “it depends” statements) and about a Fortune 500 company that has other intellectual property. Ultimate risk to an organization out of compliance with PCI is well documented (on the Card Brand sites themselves and breach news sites), but stems from a violation of contractual agreements with the business’ banks and ultimately the card brands. This contractual obligation (and violation) can be determined without a breach. The violation (profiled in a public court case out West) can be identified when a QSA / Forensics team from the Card Brands / or any of their team members conduct an assessment of compliance to the organization. The court case referenced is of a restaurant that had been suspected of a Common Point of Fraud; proven to not have been breached, but in violation of PCI DSS based on forensics report issued to Bank & Card Brands). So, the risk and associated damages can result from a breach (classic) or simply by confirmation that the business violated the contract established with the Card Brands. The highlight here is that the risk is not addressed by the issuance of a ROC by a QSA or having run assessments, but that the security and risk programs are operational and effective. These ROC and assessments are simply attestations of a program that is mature and functioning. Compliance is not deemed by a ROC nor does it provide safe-harbor in the common sense of the term. A long standing statement by the PCI SSC is that “no compliant organization has had a breach” <– including TJX, Heartland Payments, and Global Payments all breached with current ROCs signed by TrustWave. The success of the PCI program is the ultimate reduction of risk and adequate security controls of the organization. The risks addressed through a cohesive integration with the operational elements of the business are the critical success factors. Symantec was the victim of an attack where its source code for most major products protecting consumers and enterprises around the world was breached. This attack occurred in 2006 and the source code has been available to parties to leverage for attacking businesses, individuals, and governments since that time. Recently, by the accounts recorded so far, Anonymous gained access to this stolen source code and is now threatening to release it – either generally or for a fee to those who would find value in it. The result of this has lead Symantec to state in their Security recommendations whitepaper to uninstall or disable the PC Anywhere application. This is a critical application for most, so such a recommendation is quite difficult. Other major enterprise security applications were also stolen, do the same risks exist and are forth coming? Symantec is an important security provider, as their systems are installed on a 100+ million end points globally and their PC Anywhere solution provides direct access to global companies. Focus on your programs of complicating the intruder to your system – a great case here … if a malicious user had access to your network what could be done. This question should provide a substantial return in minimizing this type of breach of trust in the security model. Similar cases should include Microsoft remote tools, operating system, and other infrastructure high install base applications. Below are references to the article, paper, and Symantec’s update page. Here is Symantec’s update on patching the applications. This impacts all secure environments – PCI and other systems that are depended upon. Perhaps the attack is not intended to modify or damage a system, but for corporate espionage and such. Strong practices and a aggressive risk assessment review cycle is in order – such as ISO 27001 ISMS (done correctly and maturely). 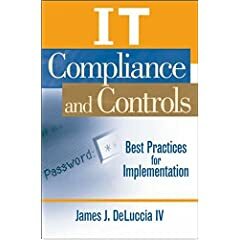 An interesting thought exercise is would businesses be compliant with an industry standard, such as PCI DSS, and regularly evaluate their security posture against this standard if there was NO fines, punishments, or financial liabilities present? Would organizations secure and establish the same safeguards, better safeguards, or let the environments float away out of a compliant posture? These are the questions that comes to mind when reviewing the counter-lawsuit of the Utah Merchant against U.S. Bank claiming that the financial institution wrongfully seized money from their account. The money ($10,000) was seized to pay part of the $90,000 fine that Visa and MasterCard imposed on the establishment. What is interesting here is that … through forensic review the Merchant systems were proven to not have (likely) been breached, but Visa and MasterCard actually fined the Merchant $1.33 million for being non-compliance (a result of having used 2 of the 6 approved forensic firms). Ultimately the fines were reduced. An additional interesting bit is 2 banks stated they incurred losses as a result of CPP (Common Point of Purchase) breach sourcing technique. This added about $13k additional fines. Despite no evidence being provided. This is a unique example where the correctness of passing liabilities to merchants and members of the payment card universe will be challenged. As a result the entire underlying Payment Card Data Security realm too. Businesses of course have incentive to protect customer data, but to what extent and when the liability moves up to the payment gateways, banks, and card brands – how will practices change? There are great examples of standards that are created collaboratively (NERC CIP pre-Energy Act Law) and adhered to, but there are many where standards exist without true adoption and success. What will the protection of sensitive card data look like in the near future? How will information security programs evolve when there is no mandate? A lot of questions to consider moving forward. The attacker victim scenarios we designed are no longer appropriate. It is amazing that no less than a decade ago I was working with teams to design information security attack scenarios where we were dealing mainly with mafia, ex-intelligence agents, and loose nit groups. Now we have countries organized and attacking with some brilliant attack strategies. The sophistication, coordination, and execution of these is obvious to be conducted by military / intelligence professionals. Despite all the conjecture it has been difficult to prove, as usually only victims and logs stand as evidence. The developments of YamaTough present a hard case where a countries espionage activities may be exposed. I would encourage reading the multiple great articles on this topic, a superb starting point is InfoSecIsland. The facts are critical to understanding how to protect company, personal, and government assets. The actions are key to understanding what is at stake, and how critical it is to be ever agile to these threats. A progressive outsourcing / partnering has occurred with businesses where access to key networks are allowed, at least for a temporary basis. In some cases the security design, management, log monitoring, and underlying software are all designed by third parties. The cost of overseeing, testing, vetting, and validating the integrity / security of these operations must be considered at this time. Organizations must seek assurance regarding the operations of third parties, but also institute monitoring, detection, and response capabilities to ensure the ability to identify and limit these events.